After admiring the original of this statue in Edinburgh, Scotland, William Larrabee ordered a replica sent to a small town in northeast Iowa. Larrabee, a former Iowa governor, had installed huge bronze statues of Union generals on the grounds of his nearby estate and wanted a public memorial to Civil War soldiers and sailors for his hometown. 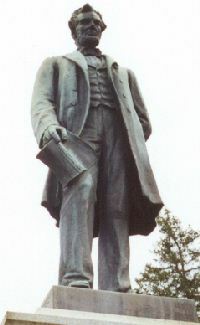 Erected in 1902, the statue stands in Lincoln Park on Highway 18 at Stone and Mill streets. The original work depicted President Lincoln with a freed slave, but this version shows him with one hand behind his back and the other holding the Emancipation Proclamation. Sculptor George Bissell, who fought with a Connecticut regiment during the war, also created four war scenes in relief for the pedestal.